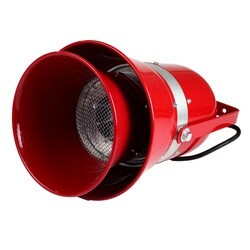 Heavy duty, industrial design, motor driven siren that emits a continuous loud piercing wail. Mounts to any solid surface using two bolts. May be swiveled through 180°, vertically or horizontally, depending on orientation of bracket. Used for initial installation and MRO applications in factories, lumber yards, security installations, and score boards.